Belated Happy Ganesha Chaturthi to all my friends. 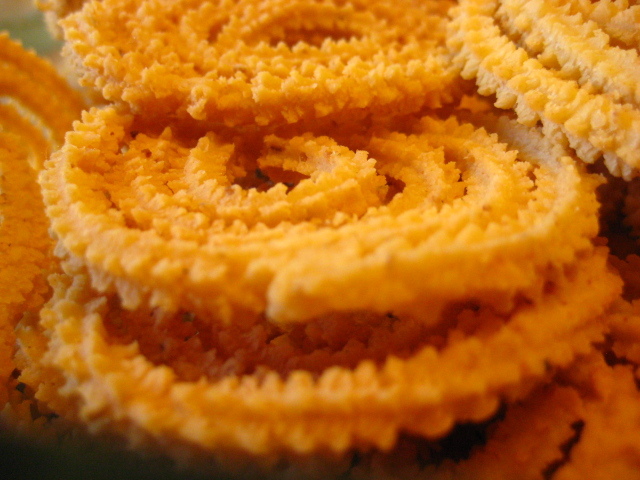 As we all know, Chakli is one of the special dishes which will be made for Ganesha festival. 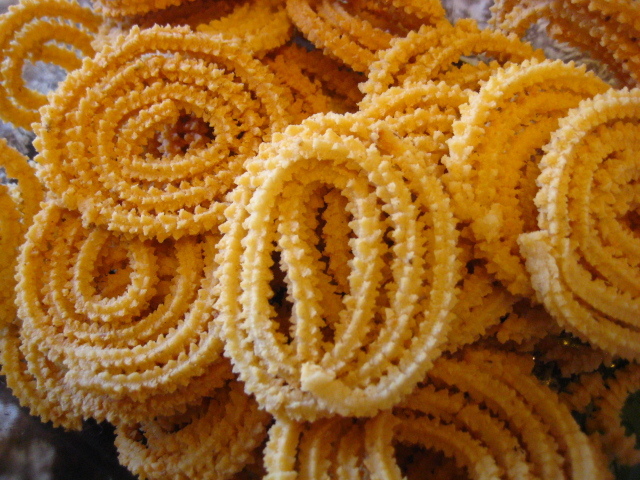 I do not have to write much about Chakli. I am sharing here a simple recipe handed down from my mom. 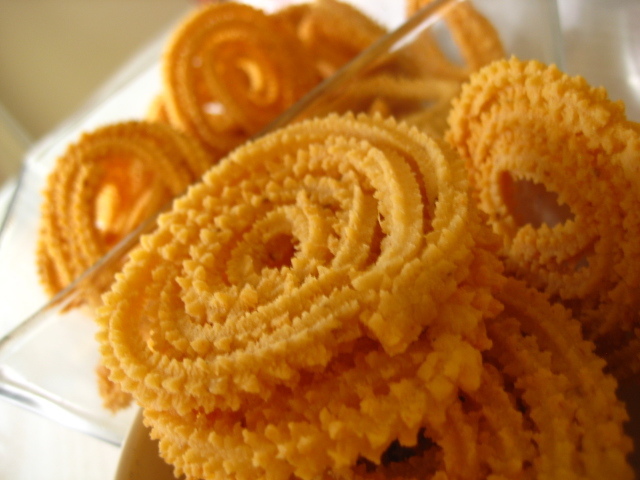 I do not know how many of you use Milk while preparing chakli. If have not used milk before, try with milk this time :-). I think 5 cups of flour is a lot, it really tested my patience..You can reduce the quantity of the flour if you do not have lots of patience! !.Hope you will enjoy. 1/2 cup Hurigadale/ putani/ dalia/ roasted channa dal. 1/4 cup Urid dal/ black gram dal. Dry roast the Rice flour in a thick bottom pan for about 6-7 min on a low to medium heat with constant stirring. Do not burn the flour. Keep it aside. Dry roast the Hurigadale and Black gram dal separately until become light brown. Please roast both of them on a low heat. Hurigandale would take just 1-2 min. Do not burn..
Then make fine powder of both hurigadale and Urid dal. Then mix with roasted Rice flour. Add crushed Cumin seeds and salt to taste to the above mixture. Then mix well. In the mean while, take 7 cups milk in a wide mouthed griddle and bring to boil. Take out about 1 cup of milk and keep it aside. Then add Butter, allow to melt. As soon as Butter melts, take off the griddle from the stove. Immediately pour Rice flour mixture. Mix well. Add some milk if required. 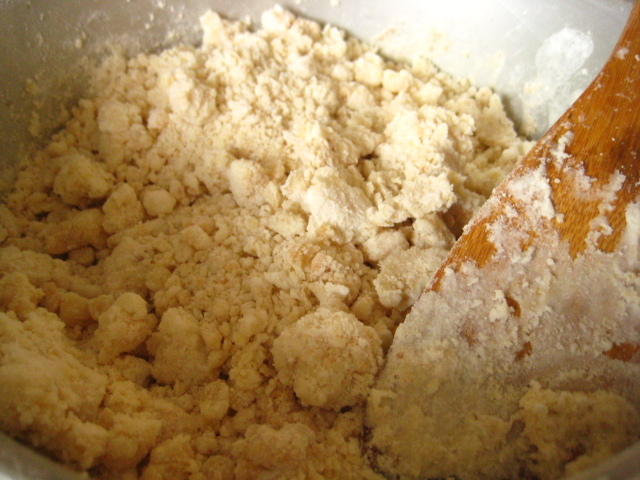 Dough should not be very dry or watery. Cover the griddle with a lid or a plate. Leave it for 10 min. 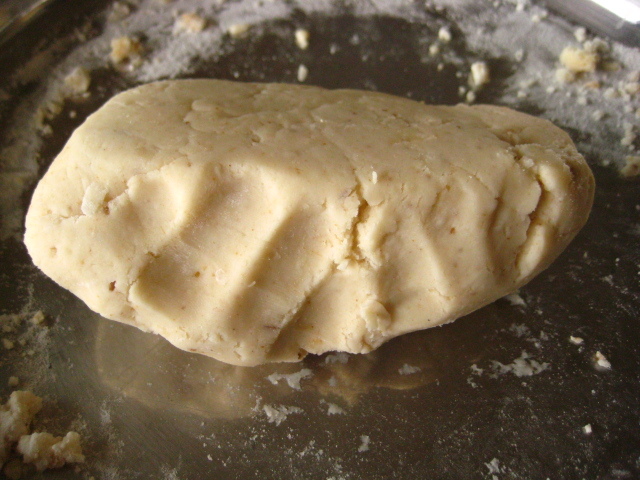 Then take some( say 2-3 ladle full) dough in a clean surface or a plate and knead very well into a soft dough. You can sprinkle very little milk or hot water if you feel the dough is dry. Then fill the dough into a chukkuli maker/ mould and press into coil shape on a wet muslin cloth. Then carefull transfere to hot oil and fry until light brown on a low to medium flame. Store it in a airtight box. Note: Keep the remaing dough / griddle closed while kneading/ frying because dough gets dried if you keep it open. I prefer wet muslin cloth so that it doesnt allow the pressed chaklis to be dried and breaking. 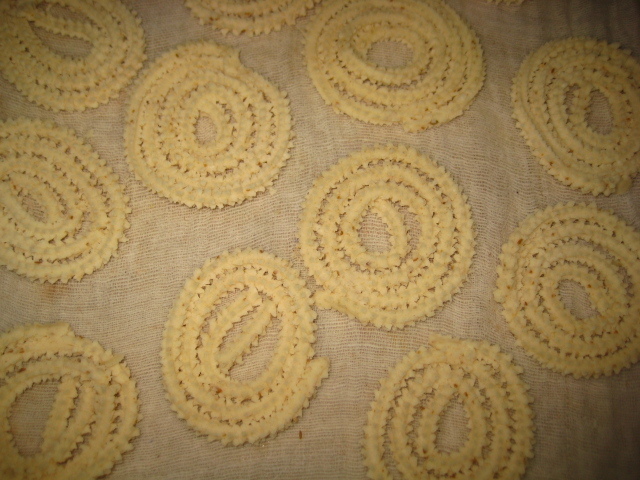 If the dough is not kneaded well, we can not give the proper shape and cant make desired size chaklis.